On 23rd and 24th August 2018, under the project “Sustainable Fisheries Conservation Management through Collaborative Approach in Boeung Chhmar, Kampong Thom Province, Cambodia”, funded by the Critical Ecosystem Partnership Fund (CEPF) and implemented by The Learning Institute (LI), the committees of both Doun Sdeung and Peam Bang Community Fisheries (CFis), the Peam Bang Sangkat Fishery Administration, and the Peam Bang Commune held meetings to discuss the specific boundary demarcations of the community fishing and fish conservation areas of each CFis. The Learning Institute has played an important role in facilitating and providing technical support to the two CFis to demarcate the boundary of community fishing and fish conservation areas. LI, with the participation of Sangkat Fishery Administration of Peam Bang, the commune councils, the village chiefs, CFis committees, and representative villagers, has used Global Positioning System (GPS) equipment to collect Universal Transverse Mercator (UTM) coordinates to determine demarcation zones. These meetings and corresponding activities were aimed towards identifying specific boundary points of the community fishing and fish conservation areas in both CFis at the relevant field sites. This would contribute towards better navigation, through the marking of natural features (such as trees) within each area, so as to ultimately develop an unprecedented official map that incorporates the new boundaries of the community fishing and fish conservation zones. On 23rd August, under the facilitation and coordination of LI staff, Doun Sdaeung CFis committees and relevant stakeholders, including Sangkat Fishery Administration of Peam Bang, local authorities (such as the commune council and the village chief) and elder representatives of the village discussed and agreed on draft border points in a participatory mapping process before visiting the site. After the meeting, the whole team conducted fieldwork at the location of the demarcated community fishing area and fish conservation areas by using GPS equipment to take the UTM of the boundary coordinates of the conservation zones. 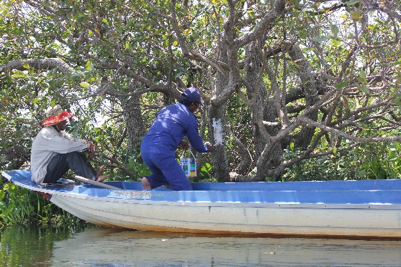 As a result, the Doun Sdeung Senchey CFis has marked 15 main border points for its community fishing area and 4 main border points for Ches Keov’s fish conservation area, with a size of approximately 11.5 hectares. These border points have been showcased through painted marks on trees so that it is easily visible and legible for community members when fishing. The next day, on 24th August, the LI team continued to facilitate its fieldwork activities, this time in Peam Bang CFis, before visiting the site. The community fishery committee and other relevant stakeholders organized a meeting to discuss and agree on the demarcation of main border points for both the community fishing area and fish conservation area in the draft map, before conducting the UTM of the border points. As a result, the Peam Bang CFis has marked 8 main border points for community fishing, and 4 main border points for fish conservation areas. 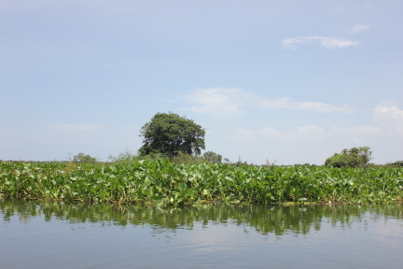 Around 200 hectares of the fish conservation area is around the Tonle Sap Lake, near the flooded forest of Peam Bang commune. This field visit by LI staff helped lay the groundwork for setting up, for the first time, an official map that incorporates the demarcation of border points for both community fishing and fish conservation areas in both Doun Sdeung Senchey CFis and Peam Bang CFis.